The wave herringbone pattern of the Adidas J Wall 2 must have worked because a lot of users mention that the traction is excellent. Several users say that the shoe model is true to size. A number of testers mention they like using these Adidas basketball shoes for indoor plays because of the performance of the wavy traction pattern. Many users say that the shoe is comfortably wide. Multiple buyers commend the optimum support provided by the QuickFrame technology on both sides of the shoe. According to a good number of reviewers, they are more than satisfied with the outsole rubber. They say dust and debris do not stick easily. The Adidas J Wall 2 comes in multiple colorways buyers can enjoy just like the third Harden basketball shoe. A number of users mention that they need to replace the insoles of these John Wall basketball shoes with thicker ones for a little more cushion. The shoe starts to have a squeaking noise after breaking in, a few owners say. Some buyers claim that there is not much impact protection from these Adidas shoes. A handful notice that the laces are flimsy and not durable enough. A few comments that the synthetic leather upper feels like plastic. The Adidas J Wall 2 is a good performer overall, bringing with it significant upgrades to the cushioning and traction of the previous Adidas John Wall shoes. Though not that spectacular, reviewers and testers are happy with the blend of court feel and bounciness. If you are a player who loves to do drives and explosions on the court, this shoe model is the right choice. It has a good court grip that will make you feel in control of the game. Athletes with wider feet are going to enjoy the extra space in the forefoot area. They have some good elements in place to make them a really solid and affordable option on-court. These are right on the line of 'no go' or 'get em'. I don’t know about you, but I would go for something different, honestly. 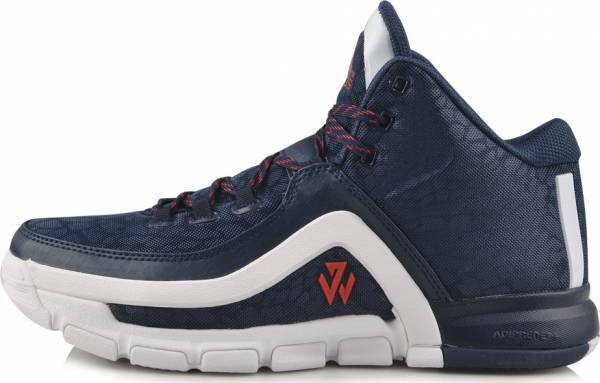 The Adidas J Wall 2 is another signature shoe for Washington Wizards point guard John Wall. Given his fast-paced playing style, the shoe is designed to be lightweight and with a lot of support. The QuickFrame technology of Adidas provides great ankle support. It also gives explosive speed on court. John Wall was a free agent for a couple of years. When he signed an endorsement deal with Adidas, he gets to have a colorway with the Marquee Boost. After its release, Damian Lillard’s 5th signature shoe starts to make news. Adidas continues to improve their innovation to meet the non-stop demands of consumers. Cushion. For a speedy performer like John Wall, efficiency and propulsion are prioritized. The Adiprene+ technology added in the heel of the shoe provides a good bounce. The material absorbs the impact and helps with the take-off and multidirectional footwork of the player. Traction. Basketball guard athlete John Wall is described as an aggressive and no-nonsense player of the NBA. To match his playing characteristics on the court, the outsole of the Adidas J Wall 2 is designed with a non-scuffing rubber compound. It does not leave marks on the floor especially indoor gyms. The herringbone pattern has soft, pliable waves, which delivers a good court grip. However, many reviewers recommend the shoe for indoor use only. Though the rubber grooves deliver amazing court performance with no slippage, outdoor courts can be rough and can destroy the rubber outsole quick. They also suggest clean indoor gyms for playing. The outsole accumulates a lot of dust and the player has to wipe frequently to avoid injuries. Length and Width. The Adidas J Wall 2 is not your ordinary shoe model for guards. It is wider than the standard. Athletes with normal lengths and widths are suggested to go half a size down or double up the socks. The toe box is roomier than the usual designs in the market. There is enough space for the toes to flex. It is also easier to slide your foot in. Lockdown. The shoe model uses flat laces. The desired fit can be achieved by adjusting the tightness of the shoelaces and placement of the tongue. The upper of the Adidas J Wall 2 is composed of synthetic leather and mesh. At 14 ounces, this shoe model is not considered light. But with the weight comes durability. The mesh material is in the toe and heel areas. It helps with the ventilation of the foot. Inside the shoe is the QuickFrame TPU foam. It is a foam layer that provides great ankle support. For a court slasher like Wall, the QuickFrame technology is a lot of help. The Adidas J Wall 2 is a stylish mid-top shoe that comes in unique colorways. There are a lot of details in this shoe which describe John Wall’s personality. The outsole has engraved callouts JSW, Mama’s Boy, Five Deep, Great Wall and Raleigh 919. His logo is displayed on the forefoot, marking it as his signature shoe. The lateral side of the shoe also has the same logo. In the midfoot, protruding lace loops are sewn to the eyelets. The tongue has the adidas callout and logo on the top. In the middle of the tongue and in the toe cap, GREAT WALL callout is displayed. The Adidas J Wall 2 also has special colorways that the subsections below will briefly put the spotlight on. On a one-of-a-kind upper, the Adidas J Wall 2 3D has three-dimensional white and blue graphics. This colorway is also nicknamed the Adidas J Wall 2 Zebra because of the stripes-like pattern. The Away colorway is also dubbed as the DC Blue colorway. It comes with a predominantly blue upper with a white midsole and white outsole. The red accents are seen on the shoelaces, Adidas logo, and JW logo. As part of the 2016 Black History Month Collection, the Adidas J Wall 2 BHM is dressed in white and gold. It takes inspiration from Jesse Owens, who was a legendary US sprinter who won in the 1936 Berlin Olympics. In January 2016, Adidas debuted the Chinese New Year colorway in limited pairs. It comes in a combination of navy, vivid red, and shock blue. It also features some unique graphics. The Chinese New Year colorway is also called the Adidas J Wall 2 Year of the Monkey. For Christmas 2015, the Adidas J Wall 2 debuted a green and copper combination, which sits on a mint green translucent outsole. For Halloween 2015, the Adidas J Wall 2 is released in a colorway that has glow-in-the-dark detailing and insoles that feature special graphics. This colorway is also called the Adidas J Wall 2 Night of the Ballin’ Dead. The Home colorway of the second John Wall basketball shoes celebrates the player’s rise as an elite guard of the NBA and esteemed member of the US Olympic Team. It comes with a predominantly white upper with a gray camo rear panel and scarlet accents. The Adidas J Wall 2 Xeno is an all-black pair with reflective accents, including the Three Stripes on the rear panel, Adidas logo on the tongue, and the John Wall logo on the lateral side. The Xeno colorway is also applied to the J Wall 1 and other Adidas models.